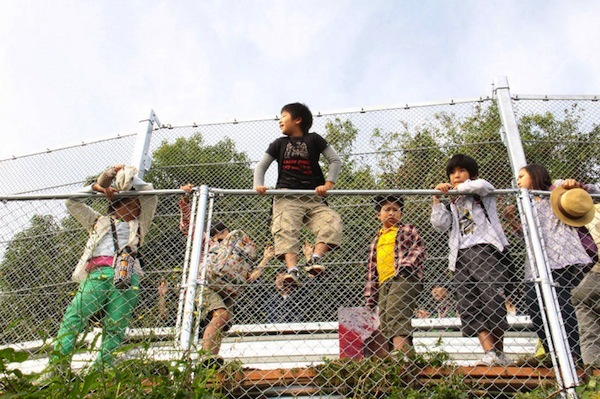 Pre-teen brothers Koichi and Ryunosuke have been separated from each other following their parents’ divorce. Thoughtful elder-brother Koichi has followed his mother Nozomi (Otsuka) to his maternal grandparents place in sleepy Kagoshima. Lively Ryunosuke lives with his indie musician father Kenji (Odagiri) in the more vibrant Fukuoka. Both places are at opposite ends of Kyushu and their only contact is by telephone. Despite putting on a brave face Koichi longs for his family to be reunited while Ryunosuke is more accepting of their situation and too busy doing other things like growing vegetables and taking care of his lackadaisical father. One day in school Koichi hears that when two bullet-trains pass each other the resulting energy is strong enough to grant the wish of anyone seeing it occur so he devises a scheme that will see himself and his friends skip school, evade their parents, journey across the island and meet Ryunosuke and his friends at a point where newly built lines connecting Fukuoka and Kagoshima meet so they can make a wish. What does Koichi want? For his family to get back together again. Are things that simple? Kore-eda started his film career as a documentarian but has become better known for his family dramas like Still Walking (2008), Nobody Knows (2004) and his most recent release Like Father, Like Son (2013). Kiseki fits into this strand of his work. What marks it out as special from the aforementioned titles is that compared to the tragic Nobody Knows and the elegiac and hugely bitter-sweet Still Walking, it has a more adventurous and happy tone despite the subject matter. Indeed, it is like a reaction to the dark subject-matter of the earlier films. The backdrop of divorce could be miserable and the plan behind the madcap journey the children embark upon is so full of holes that there is a lot of room for danger but the film takes place in a sunny and brightly lit world where danger never rears its head and adults are all sympathetic or at least turn a blind eye to the children’s actions. There is a large cast of characters and each gets their own moment but it is the children’s journey that matters most. What the audience gets is a sense that these kids are on an adventure and that is fuelled by everyday longings, an adventure that is fun to be a part of and ultimately an adventure necessary for the children to grow up. 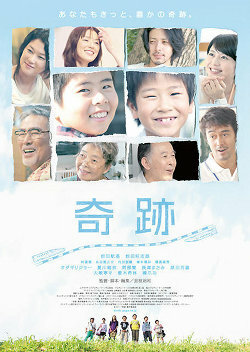 Kiseki is the Japanese word for miracle and it is the children in the film who believe in them. At an age where they are aware that change is coming (Koichi is about to go to junior high) they are caught between wanting things to remain the same and having huge dreams they want to achieve like becoming a baseball player or getting married to the beautiful school librarian. Ryunosue’s friend Megumi wants to be an actress while barrel-shaped Rento wants to run better. Koichi selfishly and hilariously wants the volcano to blow so that his mother will move back with his father, never mind compatibility between the two adults or the fact that everyone else in town will die from the eruption as a friend points out. It is his wish to bring his family back together that inspires the gang of friends to embark on their journey to see the bullet trains pass each other. Through dividing the film between detailing the children’s backgrounds and climaxing with their journey we get the background details that make their wishes so potent and it is here there is nuance as shown by the context building scenes. Rento is embarrassed at being slow and overweight and Megumi’s mother has bitter memories of being an actress and does not believe her daughter can make it. The brothers might be separated by divorce but between friends and family they are well looked after and their situations are showing signs of permanence. Perhaps it will take a miracle to reunite the family but is the natural desire to be together necessarily a good thing? Each brother has a different memory of home as revealed by flashbacks in dreams they have. Koichi can only remember the good times while Ryunosuke remembers a ferocious dinner-table row between Nozomi and Kenji. Ryunosuke might have to take care of his father but he enjoys the responsibility and freedom it entails, the people he meets and places he goes and he has matured more than Koichi might like. More importantly their parents are getting on with their lives. Nozomi is rekindling old friendships while Kenji is working hard with his band, aiming to be a great guitarist. With each moment of bittersweet reality the children endure the film shows signs of great complexity and understanding for the characters. Kore-eda, with his customary skill at working with children, and he has picked a selection that are highly talented, especially the real life Maeda brothers. The acting of them all is very natural and. each child is well-realised thanks to the script so you could imagine them living a life off-screen and succeeding in achieving their goals. Ultimately their trip together will make them mature, make them realise their concerns are part of a bigger scheme of things and that they are not alone, they are part of the world and that hoping for miracles is great, hard work is even better. Their adventure was fun and meaningful, watching it was too. Good review! Definitely in my Top Ten films of the year! I should do a Kore-eda season but I have lots of other reviews to come and I wanted to get these ones out because Like Father Like Son is on theatrical release in the UK. It reminds me a bit of Stand By Me, becoming mature after a journey. I think I would like this novie. I hope someone will provide it for me soon. I love family and friendship story. Great review, as always, Jason. If you like those sorts of stories then I think you would like I Wish/Kiseki. It’s easy to watch and very charming.